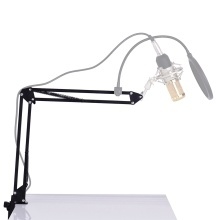 Microphone scissor arm stand designed for studio recording, network broadcast, online singing, etc. Metal material, durable and sturdy, and max. load capacity is about 1kg. Folding and adjustable design, convenient to carry and easy to adjust the usage angle and height to show your perfect voice. Comes with a microphone holder whose diameter is about 3cm/ 1.2in. Please check your microphone diameter before ordering it. Including a table mounting clamp, the microphone stand can be mounted on the table with thickness less than 4.5cm easily. The microphone showed in the picture is not included.